The NFL: Big Business With Big Tax Breaks The administrative branch of the National Football League is tax-exempt, and many wealthy team owners can get generous subsidies from local governments for stadiums. Critics argue the public money could be better spent elsewhere. But can you put a price on the love of the game? MetLife Stadium in New Jersey will hold the 2014 Super Bowl. The stadium gets a break on local property taxes. If you're a football fan, Sunday is kind of like Christmas. Two conference championship games will determine the teams that advance to the Super Bowl, and the matchups couldn't be more exciting: Denver vs. New England (Peyton Manning vs. Tom Brady). And some would say the other game, pitting San Francisco against Seattle, might just feature the two best teams in the league. America shows its love for the sport in many ways beyond breathless anticipation of big games. It also gives back to the National Football League with tax breaks and publicly funded stadiums. But does the multibillion-dollar business really need the help, or is the NFL getting a free ride? If you walk into NFL headquarters on Park Avenue in Manhattan, "you think you're in the headquarters of Goldman Sachs," says Gregg Easterbrook, author of King of Sports: Football's Impact on America. The NFL is registered as a not-for-profit, tax-exempt organization — even with a commissioner who makes nearly $30 million a year. From the tax code to big stadium deals, critics say the NFL is getting millions of public dollars that would be better spent elsewhere. The NFL league office is organized as a 501(c)(6), a part of the tax code that exempts thing like business leagues, chambers of commerce and trade associations. But that's just the league office, not the 32 individual franchises. "There is no tax break at the NFL for revenue earned from things like ticket sales or jersey sales or corporate sponsorships or television money," says Jeremy Spector, outside tax counsel for the NFL and a partner at Covington and Burling LLP. Spector tells NPR's Arun Rath that the NFL, including its teams, brings in around $10 billion of annual taxable income. "None of those revenues are escaping tax. It's the league office — that organizational or administrative arm — that's exempt," Spector says. The administrative arm handles things like writing the rulebook, hiring referees, running the college draft and negotiating stadium deals. Republican Sen. Tom Coburn of Oklahoma says it's absurd to call the NFL a "trade association." He's proposed changing the tax code to end the exemption and start collecting taxes from pro sports organizations. "In a time when we have a $640 billion deficit — and that's the best we've had in five years — shouldn't very wealthy ... sports leagues pay their share?" he asks. Spector, lawyer for the NFL, says sports organizations are being unfairly singled out. "I think it's very dangerous if Congress starts picking and choosing which industry or which industry trade associations are eligible for the tax exemption," he says. 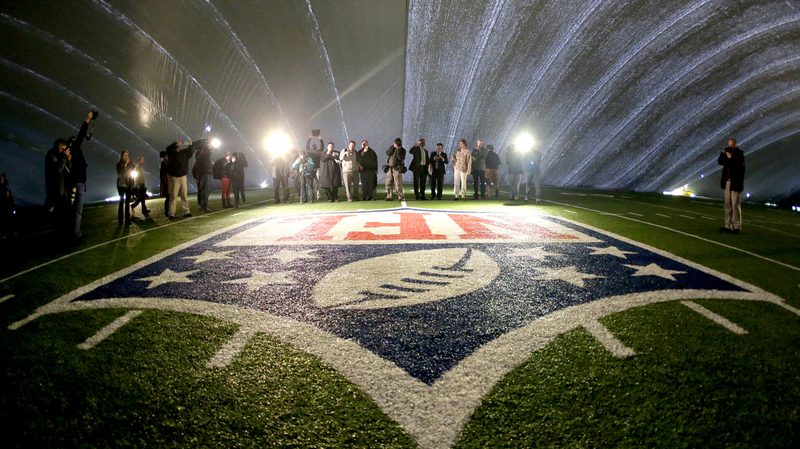 Besides the tax exemption, the NFL can also get a break through big stadium deals. Take, for example, the Dallas Cowboys. In the late 1990s, the Dallas Cowboys and the team's owner, Jerry Jones, began plans to expand their stadium or build a new one. Jones shopped in and around Dallas for years, asking for public assistance to fund the stadium. Arlington Mayor Robert Cluck saw an opportunity for the city, and a tough sell to voters. "It was difficult, it certainly was," he says. "We explained to them how it was going to work, where it was going to be located, the amenities it would contain. So after we explained it thoroughly, it really was not very difficult." To pay for that, voters in Arlington agreed to raise taxes: a higher sales tax, plus hikes on rental cars and hotel rooms. Cowboys Stadium opened to the public in May 2009. Cluck says the economic benefits are tangible: Groups use the stadium throughout the year, not just on game days. Plus, he says, building the stadium has increased property values in the surrounding area. All in all, he says, the stadium was worth it. "I'm sure you can find somebody who is against it. I have not seen that person since it was completed. I think people are very, very happy with it," Cluck says. Dan O'Connell, who manages a sports grill about a mile away from the stadium, says he originally voted against the tax increase. "But in retrospect, I think it was probably a good thing for the city," he says. "It seems to draw a lot of people in on the weekends and during games." Resident Jordan Fitzgerald doesn't agree — and doesn't like the tax bill. "It was not worth it, whatsoever. Why? Because my tax money went to a ... stadium instead of my own benefit," she says. But resident Robert Henning thinks the stadium put Arlington on the map. "It's a worldwide icon for football, which I think is the greatest sport on the planet, and it's bringing a lot of income to our city," he says. "And it's bringing more people here. They see the promise, and that's what we want." 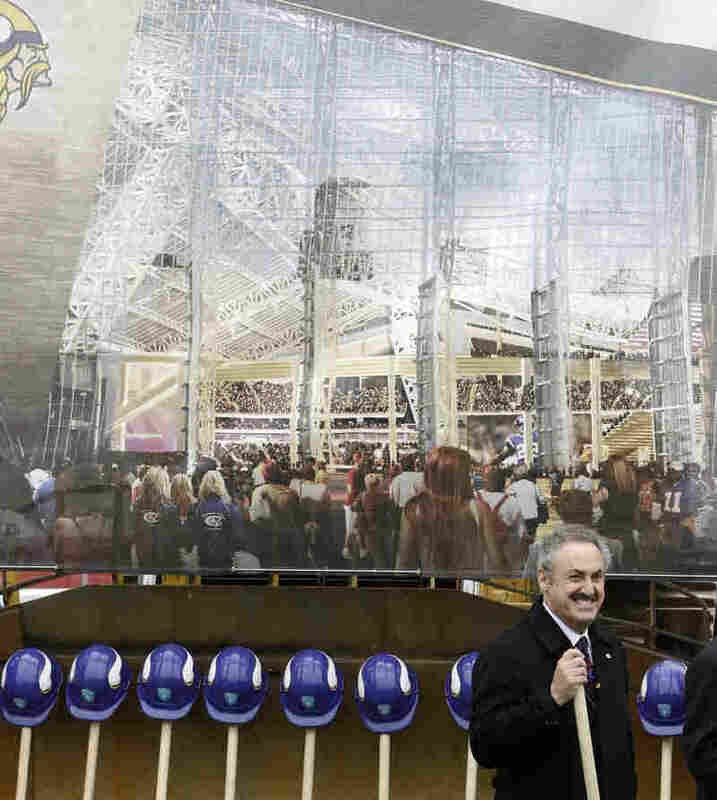 Easterbrook says he's heard this argument before — that stadiums boost local economies. But he says it doesn't stand up to scrutiny. He says investment in infrastructure like roads and bridges "has a multiplier effect every day of the year." Spending on stadiums, on the other hand, "has a multiplier effect 10 or 12 days of the year." "In terms of civic investment, football makes no sense at all — not only its lack of multiplier effect on the local economy, but far more importantly, all the owners are billionaires," he says. "It can pay for its own stadiums." Compared to similar businesses, NFL stadiums pay little or no property taxes. "Research shows that about 70 percent of the cost of building and operating the NFL stadiums has been paid for by the public," Easterbrook says. "I estimate if you roll it all together — subsidies, tax favors etc. — it's roughly a billion dollars a year." Take the MetLife Stadium in New Jersey, which will host this year's Super Bowl. Easterbrook says comparable businesses pay about $20 million a year in local property taxes. "It pays $6 million a year through a political agreement that exempted the billionaire ownership families of the Jets and Giants that jointly own that stadium from the kind of taxes that are paid by mere average people," he says. But not giving in to subsidy requests could also be a bad political move. Easterbrook points to Minnesota, where the family that owns the Vikings threatened to leave a year ago and convinced the state Legislature to spend millions on a new facility. Easterbrook doubts the team actually would have left, but he says the governor had essentially two options: "One, he can say, 'I'm the man who kept the Vikings in Minnesota;' or maybe if they left ... then he would have been blamed for losing the Vikings." Even if the public loses money in the end, there's a powerful variable in the equation: the intense love fans have for their teams. "People like to have an NFL team at home, they like going to the stadium, and they don't want to lose that," says Spector, the NFL tax counsel. "And if the public ... decides that they want to spend some public dollars to keep the team there, to help build a new stadium, that's their decision to make. I don't deny that these are tough decisions for a community. There are limited dollars." The people who want to roll back the favors to the NFL are having a hard time finding allies. After four months, Sen. Coburn has only one co-sponsor for his bill, and he can't even say who it is. Just this week, this lone voice in Congress against public help for pro football announced he's retiring at the end of this congressional session.